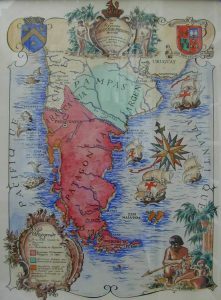 Following the Falklands War, in June 1982, between Argentina and the United Kingdom, militant far right elements began to question the existence of Mapuches in England: more and more antipathy became focused on Mapuche International Link towards the end of the nineteen nineties – solely due to the fact that they are based in the UK. We can find no other explanation considering that other organisations expressing solidarity with the Mapuche exist in several other European cities, and none of them have drawn the same level of vilification or interest from these groups. Mapuche International Link was founded on May the 11th, 1996, to support the Mapuche people. It has its origin in CEM (Comite Exterior Mapuche), an organisation founded in London in January 1978. With the return to democracy in Chile and Argentina some Mapuches returned to their country of origin, while others discontinued their political activities in the United Kingdom and in other European countries. In contrast to the CEM, which was comprised exclusively of Mapuches, MIL is made up of Mapuches and also volunteers of British and various other nationalities who sympathise with the plight of indigenous peoples in general and of the Mapuche in particular. The Mapuche, together with an assortment of peoples situated in the regions known as Araucania, the Pampas, Patagonia and Futawillimapu (large area of land comprising the southernmost area of what is now Chile and Argentina) fought united for hundreds of years and defeated Spanish colonialism. Mapuche territory at that time was divided into four distinct areas, known by the Mapuche as Meli Wixan-Mapu (4 butalmapus), these areas being known collectively as Wallmapu. The four territories comprising Wallmapu were bound together by a political institution known as the Futa Koyang (Great Parliament), an organ that united and represented the Mapuche and also elected the Toki (the highest political military authority) and signed treaties with Spain. It is established in international law that only sovereign states can sign border treaties; in accordance with this norm the status of the Mapuche as a nation state was recognised in the treaty of Killen (Quillin), on the sixth of January 1641. Border treaties between two states implicitly demonstrate that the parties concerned mutually recognise one another’s statehood – it is understood that by doing so they are negotiating on an equal footing with one another, affirming the principal of sovereign equality on which nations of that time based their external negotiations. Even today this principal still governs bilateral relations between states. In 1860 the Mapuche state found itself threatened with annexation by its two neighbours, Chile and Argentina. It was during this tense period that the French lawyer Orelie Antoine de Tounens arrived in Araucania. For Toki Magnil Wenu and his government the lawyer’s arrival could not have come at a better time; this gave him the opportunity to put into practice a new defensive strategy designed to prevent the employment of canonical laws outlined in the Doctrine of Discovery. These laws stipulate that the possessions of infidels and barbarians can be taken over and that their systems of government can be dismantled if they are not already governed by European laws or under the jurisdiction of a Christian Prince. The convocation, in November 1860, of a Koyang or parliament (an organ subject to international law) by Toki Magñil, which culminated in the establishment of a constitutional monarchy and the election of Orelie Antoine de Tounens as the first sovereign of the Kingdom of Araucania and Patagonia, had legal standing under international law that still continues to this day. This course of action in my opinion had three fundamental objectives: to reaffirm territorial sovereignty, to obtain international recognition of its independence and block the implementation of papal bulls by Argentina, Chile or any other European colonial power. In Argentina, the history of the Mapuche people known by European immigrants is that taught in schools, accompanied by photographs taken of survivors of General Roca’s military campaign from the beginning of 1879. These photos show the faces of a people decimated, impoverished and in captivity, confined in shacks, surviving in miserable living conditions – this is the vision of Mapuche history promoted so that the European population concludes that ‘This is how the natives used to live.’ The state pursues this form of teaching in order to reaffirm the stereotypes created during the ‘Campaign of the Desert’, characterised as a war between civilisation and barbarism. What they don’t tell children in schools is that this sad reality of the ‘native’ is the product of the sacking of their territory and their resources, of the breaking up of families, the destruction of their communities and the massacring of their people. Tens of thousands died of hunger, in stark contrast to the accounts of numerous Spanish chroniclers that in their time observed that the Mapuche lived in communities characterised by wellbeing and abundance. If they had lived in the poverty shown in these photos they could never have resisted the Spanish colonial invaders for hundreds of years – it was in defence of their way of life, their quality of life, their independence and freedom that motivated them to fight so tenaciously in defence of their territory and attain their independence. In Argentina, neo-fascists disguised as nationalists and blinded by an ideology of hatred and racial superiority, are determined that the truth should remain hidden – just like those who deny the Jewish holocaust in Nazi Germany, they want to obscure the Mapuche holocaust committed during the genocidal military campaigns of General Roca, the hero that they venerate. They omit to mention the Mapuche’s suffering, the sack of their possessions and the destruction of their homes and crops, the theft of their animals, the concentration camps in Patagonia and Martin Garcia Island and the sale of their loved ones, as slaves, in Retiro (now Buenos Aires). According to Argentinian propaganda, the Mapuche were a tribe of ‘savages’ and ‘barbarians’ who used to raid the estates of decent people and steal their animals, for which reason between 1876 and 1877 the border was fortified with trenches and control towers (a border that General Roca would go on to violate). What they don’t say is that the Mapuche were simply defending their territory, something implicitly recognised by Argentina in its constitution, which doesn’t refer to the Mapuche lands as being part of Argentina as they were never inherited from Spain. The actions of the Mapuche and other indigenous peoples in defending their territory were the dignified action of noble peoples who after a century of defensive war had managed to defy colonization and obtain independence from Spain, then the dominant world power. The Mapuche had made them respect the border, as would any other people defending their sovereign territory from colonial foreign invaders that established themselves in their territory without their consent and with the military support of the neighbouring country. The descendants of European migrants don’t recognise ‘that noble race of heroes’, as described by King Orelie Antoine I. It surprises them that MIL reaffirms the rights that the Mapuche people continue to demand, like the restitution of their territory, the reestablishment of their autonomy and self-determination. These demands, that are also stipulated in the UN Declaration on the Rights of Indigenous Peoples, are seen by those of European descent as contemporary demands by the Mapuche and not the expression of an independent people entitled to those rights under international law before the formation of the states of Chile and Argentina. The lack of awareness of the historic rights of the Mapuche people on the part of racist groups masquerading as nationalists in Argentina, is what today makes it inconceivable for them to understand that there might be Mapuches living in England reclaiming the rights that – according to them – they do not have. Curiously, not even the constructed notion of the foreign-ness of the Mapuche makes any sense, because even if it were true the Mapuche would have arrived long before the annexation of Patagonia by Roca in 1885, (period in which the Mapuche resistance concluded) and therefore before the arrival of the European migrants who came to try to colonise it. Although we may give credibility to the neo-fascist hypothesis that assigns legitimacy of land ownership to its original or oldest occupants, we will see that in any case it is the Mapuche that have the right to exercise this legitimacy, considering that the Mapuche territory was annexed by Argentina around 130 years ago. This is not just an arbitrary assertion – numerous scientific studies conducted by Argentinian universities show that the Mapuche lived in the Pampas and Patagonia at least half a millennium before the arrival of the Spanish to the American continent. This is corroborated by findings at archaeological sites in Patagonia pertaining to the Mapuche people. Despite this, well publicised, scientific evidence, the neo-fascists continue to insist that the Mapuche come from Chile. Mark Twain is often quoted as saying that ‘It is easier to fool the people that to convince them that they have been fooled’. This is the slogan used by the PSR, clearly a sentiment that they hold dear because the essence of the quotation if put into practice in the material they publish. On their TV channel the PSR constantly defames and slanders MIL and the Mapuche people, and to this end, uses the wartime propaganda employed again the Mapuche during the genocidal military campaigns of General Roca that are euphemistically referred to as ‘the Campaigns of the Desert’. 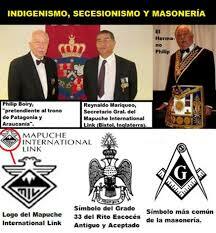 Their aim is to fool the Argentinian people, to situate the Mapuche alongside the enemy of Argentina (United Kingdom) in order to incite hatred against the Mapuche people. For MIL members brought up with modern communications technology it seems obvious that if anybody wants to know about our organisation they simply have to log on to our website and click on the section ‘About us’ and that will tell them who we are. There it makes it clear that: ‘MIL is a non-profit organization; it has never received and receives absolutely no money from any government agency or public or private entity. The tasks of our organization are carried out voluntarily by the members of the organization, who do not receive any payment for their work.’ Therefore we are not financed by the British government, neither by any other English or European organisation. The propaganda against MIL reaches even more ridiculous proportions when the PSR and other racist groups assure their audience that the fact MIL is based in Lodge Street proves that it is run by freemasons. While some affirm that we are right wing, others state that we are left wing, in respect of which MIL makes clear that: ‘MIL does not have any political or religious affiliation, nor moves for any particular agenda beyond the interests of the Mapuche people.’ But obviously this document posted by the organisation itself, and the veracity of which is easy to prove, isn’t taken into account by these groups before making their allegations. The hatred against the Mapuche, with the approval of the Argentinian government, is reminiscent of the politics of Hitler’s Germany against the Jews before and during the Second World War. A people is singled out on the basis of their ethnicity, they are demonised and classified as ‘the enemy within’, or enemy of the fatherland, to desensitise the public, then they are persecuted, their homes raided, they are detained and tortured and finally murdered with total impunity, a situation that now confronts the Mapuche people daily in Argentina. According to figures in the public domain, disseminated by human rights organisations, more than a hundred Mapuche have disappeared since the return of democracy to Argentina. The distorted version of the history of the Mapuche people, their classification as the enemy within, associated with or supported by a European power in conflict with Argentina, combines with their continued stigmatization to make members of the security forces feel contempt and hatred not just towards the Mapuche, but also towards anyone who defends them in the courts or shows solidarity with them in the streets during public demonstrations. In Chile in 2003 an official report was published by the ‘Commission for Historical Truth and New Deal with Indigenous Peoples’, the object of which was to lay down the basis of reconciliation with indigenous peoples, recognise the major part of the historical facts, in particular that of the Mapuche people, and make recommendations for a new politics of the Chilean state concerning the country’s original inhabitants. I believe that this report served to make clear the falsity of myths about the Mapuche people created during the ‘Pacification of Araucania’, utilized to justify the annexation of their territory by Chile. This initiative has not been replicated in Argentina and it is for this reason that the notion of a conflict between ‘civilisation’ and ‘barbarism’ constructed during the ‘Campaigns of the Desert’, today continues to be sustained as an unquestionable truth. The lack of initiative from the Argentinian government to clarify the historical facts the way they actually happened, doesn’t encourage understanding of other peoples, nor promote tolerance of other cultures within the country, nor help to combat the racism and the racial discrimination endemic in the country. Neither does it help to foster social cohesion and a climate of national reconciliation that ought to exist in any civilised and democratic society.